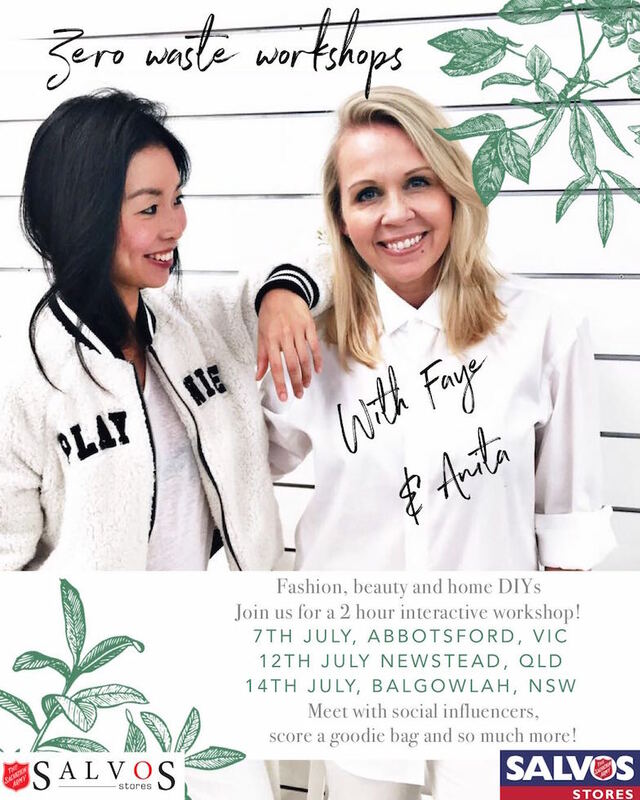 To celebrate #PlasticFreeJuly the fabulous Anita Van Dyke and I are hitting the road to share our zero waste wisdom! We will be hosting a series of FREE workshops with Salvos Stores in Melbourne, Sydney and Brisbane. I’ll fill you in on all the sustainable style vibes, while Anita has you covered when it comes to zero waste home and lifestyle. PLUS you can grab a copy of Anita’s awesome new book while you are there. Melbourne has completely sold out twice and is at full capacity. REFUSE – Say NO to plastic bags, straws, pre packaged fruit, veg and any products in this material. RECYCLE – Avoid fast fashion and join the #slowfashionmovement by heading to your local op shop. You’ll be diverting textile waste from landfill, empowering community and supporting a very worthy cause. Take your reusable shopping bags there too. Remember Individual impact is powerful…..See you there Zero Waste Warriors!